Your Garage Door does much more than simply move up and down, up and down. Is your garage heated? Is your current garage door insulated? Homeowners waste thousands of dollars each year by constantly heating their garage, only to have the heat escape through an non-insulated or drafty garage door. 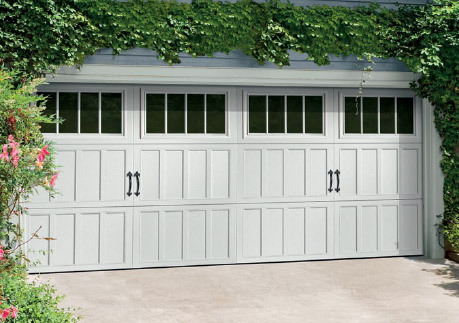 Regardless of your home, replacement Garage Doors make an excellent addition to your house. And as expected of any Window World product, our Garage Door Systems are backed by our unsurpassed warranty. Looks can be deceiving. From a distance, you see wood. Up close, it’s sturdy, durable, low-maintenance steel. The Classica Collection of Carriage House Doors. Precision-shaped doors in fresh, clean, classic carriage house styles that go up and down like traditional garage doors. Three-section tall designs, instead of four, help deliver a more authentic carriage house look. Deception never looked so good. Optional decorative hardware, reminiscent of authentic hardware found on original carriage houses, adds character to your door. Seven unique three-section stamped-steel designs. Self-Expression shouldn’t cost a fortune. With Amarr’s Oak Summit Collection it won’t. These durable steel doors offer an attractive carriage house look. Choose from a variety of door colors, decorative hardware, and window accents. Customize your home with Amarr’s most affordable carriage house door. Give your door a unique carriage house look with a variety of decorative hardware options. The Oak Summit Collection is available in four designs with your choice of ten colors and 25 windows. *Available on Oak Summit 1000/2000 only. Actual paint colors may vary from samples shown. Amarr steel doors are pre-painted; for custom colors exterior latex paint must be used. Oak Summit 1000/2000: True White, Almond, Sandtone, Terratone, and Dark Brown. Oak Summit 3000: True White, Almond, Sandtone, Brown, Terratone, Hunter Green, Gray, and Dark or Medium Woodgrain. *Price Upcharge. Tradition never goes out of style. Choose from four different panel designs to create the steel garage door you always wanted. The Heritage Collection provides a heavier gauge steel, and both collections feature durable low-maintenance doors in your choice of traditional styles. The Heritage & Stratford Collections. Great looks for years to come. Choose from contemporary or craftsmen DecraGlass windows or DecraTrim window inserts to coordinate with your home. *Heritage Flush Panel has no shadow lines. The Heritage & Stratford Collections are available in a variety of panel designs and colors. Actual paint colors may vary from samples shown. Amarr steel doors are pre-painted; for custom colors exterior latex paint must be used. Heritage: True White, Almond, Sandtone, and Brown. Stratford 1000/2000: True White, Almond, Sandtone, Terratone, and Dark Brown. Stratford 3000: True White, Almond, Sandtone, Brown, Terratone, Hunter Green, Gray, and Dark or Medium Woodgrain. *Price Upcharge. Design and energy efficiency make Designer’s Choice and Olympus doors popular models. With triple-layer construction, a thermal seal, and superior insulation with an R-value of 19.40 or 14.46, these durable, low-maintenance doors give you the ultimate in quiet operation and energy efficiency. Choose window inserts or DecraGlass windows to coordinate with your home’s design along with decorative hardware. Designer’s Choice is a bead board carriage house design while the Olympus door is a traditional short panel design. Four colors are available on select models and widths. Actual paint colors may vary from samples shown. Amarr steel doors are pre-painted; for custom colors exterior latex paint must be used. Fimbel Designer’s Choice 400: True White. Fimbel Designer’s Choice 500: True White, Almond, Sandtone, and Brown. Fimbel Olympus 400/500: True White, Almond, Sandtone, and Brown. *Available only in 8’, 9’, 10’, 16’, or 18’ widths. Update your home with the elegant Garage Door it deserves. Contact us today to request a free in-home estimate!